With American college students and graduates now owing a collective $1.4 trillion – with a “T” – in outstanding student loan debt, researchers and students are closely examining the costs of various institutions, as well as the debt held by graduates. Frostburg State University ranked among America’s best in several studies by LendEDU.com, which examined Peterson’s financial aid data for the Class of 2016 across 1,161 colleges and universities offering sufficient data for analysis, the most recent data available. Frostburg also ranked well in a study by an unrelated group, StudentLoans.net, “Public Colleges Where Students Earn the Most Scholarship Funding," which analyzed the same Peterson’s data for 500-plus public, four-year American institutions. FSU ranked number 39 in the nation on LendEDU’s list of “The Top 50 Colleges With the Best Financial Aid Counseling Programs.” This ranking recognized Frostburg’s institution-wide commitment to counseling students effectively on the financial obligations of student loans, and a Financial Aid Office that issues federal grants and scholarship awards, which do not require repayment, before issuing students loans, which must be repaid with interest. Frostburg students also have access to a significant amount of education in personal finance throughout their college careers. All first-time students at FSU enroll in an “ORIE” class, which include a unit on financial education. Hundreds of first-generation and Pell-eligible students receive in-depth financial and economic literacy education through TRiO Student Support Services each year. Frostburg offers a range of free financial management courses online for all interested students. Each FSU student who borrows a Federal Stafford Loan must complete Stafford Loan Exit Counseling before departing the University. Even among all of America’s colleges and universities studied by LendEDU, Frostburg stood out. 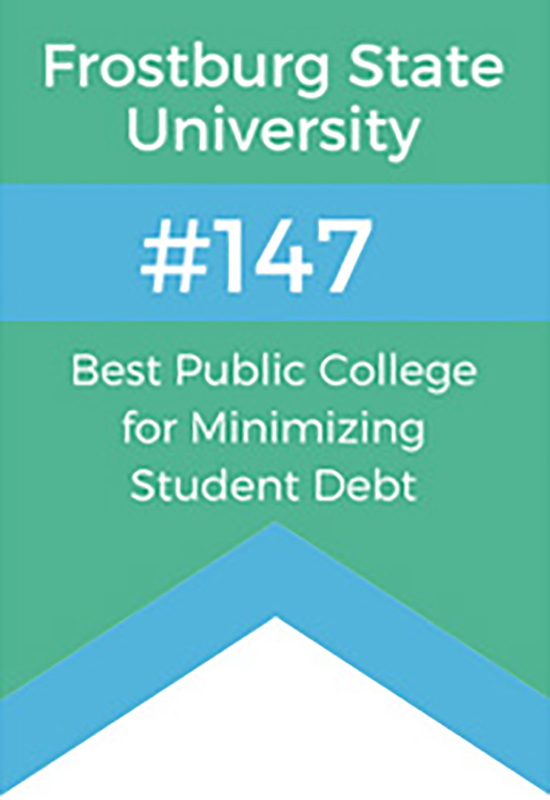 LendEDU’s “Student Loan Debt Rankings for Public 4-Year Colleges and Universities” ranked Frostburg number 147 among all four-year public institutions in America. Frostburg was ranked number four in the state of Maryland for lowest average debt per borrower. Likewise, StudentLoans.net identified the 250 American public colleges and universities that gave undergraduates the most scholarship funding. Frostburg ranked number 158 in the country on StudentLoans.net’s study of “Public Colleges Where Students Earn the Most Scholarship Funding.” For the class of 2016, Frostburg provided more than $1.62 million in overall scholarship aid, which averaged $380 per undergraduate. StudentLoans.net’s study averaged the overall scholarship aid across all of an institution’s undergraduate students. Since not all Frostburg undergraduates received scholarship aid, the average FSU scholarship recipient received a larger award than the average indicated in the study. For more information about Financial Aid at FSU, visit www.frostburg.edu/admissions-and-cost/financial-aid/index.php.